We are open for drop-offs and pick-ups between 6:00am-10:00pm every day of the year. We want to make it easy for you to do business with us, and we don't think it's fair to limit your ability to come and go as you please. We limit playgroups to a maximum of 10 dogs per group and we stay in the play yard with your dog, so he is never left unattended in a group. 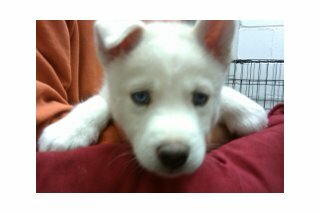 We do not charge extra for administering your dog's medication. We can feed your dog's own food while he's here; just bring in a ziploc baggie with his name on it. We encourage you to bring your dog's bedding and toys along with him so that he will be more comfortable during his stay. Your dog will go OUTDOORS to potty and play...Of course, we also have indoor play areas for use during inclement weather; but your dog gets to potty outside in the fresh air! We have puppy playground equipment, swimming pools, and shade mats installed for your dog's comfort outside. We do not leave your dog in a group all day. It is important that he gets rest time throughout the day, so we rotate your dog from playgroup to naptime, throughout the day. We offer the opportunity to add overnight boarding to your dog's visit, should you get stuck at work or suddenly have a dinner invitation. We actually stay here overnight with the dogs; something that not many kennels do! And if you do not want your dog to participate in any play sessions, but just need a safe place for him to hang out while you work, your dog will still get just as much time outside as every other dog; he just goes into a separate pen with a ball or a Kong toy, and we rotate a person into the pen to play with him or just to snuggle. Don't forget to make sure your dog's vaccines are up-to-date prior to drop off. Whatever you need, just ask! Reservations can be changed at any time, with no cancellation fees. Please provide us with a copy of your dog's medical records and any updates that need to be made to your dog's file with us. A current Rabies Certificate for dogs over 6 months old. Your mommy/daddy will drop you off whenever they want; anytime after 6 AM. The nice people that work here will take you out for a potty break and then get you all settled into your house. You can bring along blankies, toys, treats, medicine, food containers, bags, etc. It's kind of nice that they let you bring your own stuff along, you know? A lot of my pals like having their favorite toy with them, and you probably will, too. Especially if this is your first time. The nice people will take you outside for potty time before you go into your crate. Meanwhile, they will give you a clean fresh bowl of water in your crate, and fluff your blankies. I think they even leave a bone on your pillow! They put a big bucket of water out in the play area, too; I like to play in that one. It's kind of cool, because the playground is divided up into multiple areas, so they can bring all of the groups outside at one time without mixing us all together. Each playgroup has its own person assigned to watch over us...they stay right in the pen with us so that if we need help, they're right there. Of course, they also get to pet us and tell us how cute we are. I like that part! If the weather is wet or cold, we only stay out long enough to potty, and then we then move inside for more playtime. The big dog room is 125'x50'...that gives us lots of room to run! Once your playtime is over (about 35 minutes on most days) you'll go back into your house for your between-play nap. Naptime is about 90 minutes, but it flies by...you'll be tired, don't worry! After naptime, your group will meet up again out on the playground. We go outside every two hours, so get ready for some fun! At noon, we all get an afternoon snack (either one that your parent provided, or one of the Gemini Dogs snacks - sometimes they are even homemade biscuits from the bakery!) You can join me for lunch, too, if you do lunch? We eat in our crates, so there's no worries about another dog squabbling over your food! Playgroup and naptime continue like that for the rest of the day. We eat dinner by 6:00 PM, if your mommy/daddy drops off dinner for you. Well, hopefully, your human will sign you up soon and we'll be meeting you! Would you like to meet some of the other Gemini Dogs before you decide? 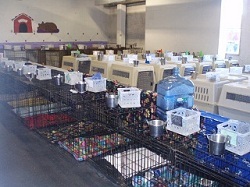 Stop by for a tour anytime; you can book one by emailing reservations@geminidogs.com. Also, you can see some of the doggies that you'll become friends by checking out the blog. Learn about our new PetPace collars! You can also purchase one of your own collars through us! If we notice that your dog just isn't feeling well...or if you inform us that he/she is just not acting right today. If your dog just had surgery and could benefit from being monitored. If your dog is elderly or has specific health issues such as seizures. For more photos, visit us on Facebook! We took the Off-Leash Play Pet Center Safety Pledge! We proudly commit that our dog daycare program has been designed for the safety of all dogs. emotionally better than when they arrived. 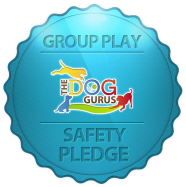 Created by The Dog Gurus, you can view our pledge, take the Off-Leash Play Pet Owner Safety Pledge and learn how you can keep your dog safe during play. The Gemini staff cares for your dogs as if they were ours! I wanted to take a minute out of my day to thank you and your employees. There were a couple specific incidents that have happened to Babalu recently, beyond anyone’s control, but I was very happy how you and your team handled both incidents. The first incident being that Babalu was unable to catch his breath at DayCare, I was so impressed and thankful how you and your team reacted to the emergency and made sure Babalu got veterinarian treatment immediately, going above and beyond staying with him while he was treated … I wondered to myself, if we had chosen a DayCare closer to home that if Babalu would have died that day. The second incident happened yesterday, when your employee walked Babalu, she noted that he had gotten at his ears, then once again going above and beyond, I was glad to get the phone call from your office, which I then was able to leave work early to attend to it, instead of finding out several hours later when I would have gotten home at 5PM. So thank you very much, I’m very much appreciative.